Classes start with simple movement, awareness and breathing exercises. These release tension, improve mobility and develop body & breath awareness. Unifying the mind, body and breath is the essence of Qigong. Basic principles of alignment are introduced, focusing initially on the main joints, the limbs and the spine. The body’s relationship to space and ground in three dimensions is then explored. This includes further engaging with the breath & mind, and is the foundation of the Tai Chi and Qigong beginners syllabus. Fundamental Tai Chi & Qigong movement patterns are introduced. These include vertical movement, shifting the centre, rotation, stepping and co-ordination of the upper and lower body. These are based on Huang Sheng Shyan’s ‘5 Loosening Exercises’. These exercises provide a framework for learning essential movement patterns in Tai Chi Form and partner practice. As we progress, they provide a basis for practising some deeper, more internal aspects of Tai Chi movement. Tai Chi Forms are flowing movement sequences related to martial arts applications. 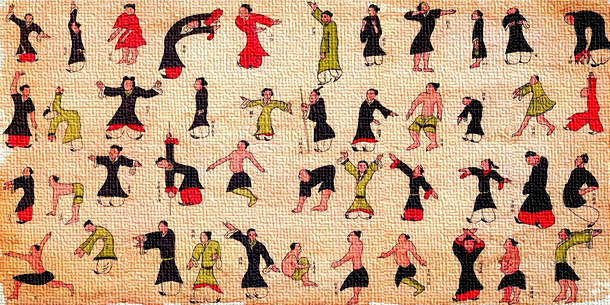 The ’37 Form’ is a simplified Yang Style Tai Chi Form. It was created by Cheng Man-ch’ing and refined by Huang Sheng Shyan. We focus on learning the opening movements of the 37 Form. We also explore simpler forms that develop fundamental principles of Tai Chi form practice. Partner practice is non-competitive and enhances the understanding of Tai Chi principles. These practices cultivate sensitivity, grounding, yielding, connection and co-ordination. Tai Chi & Qigong partner work is fascinating and enjoyable, and approached with a spirit of co-operation and mutual growth.